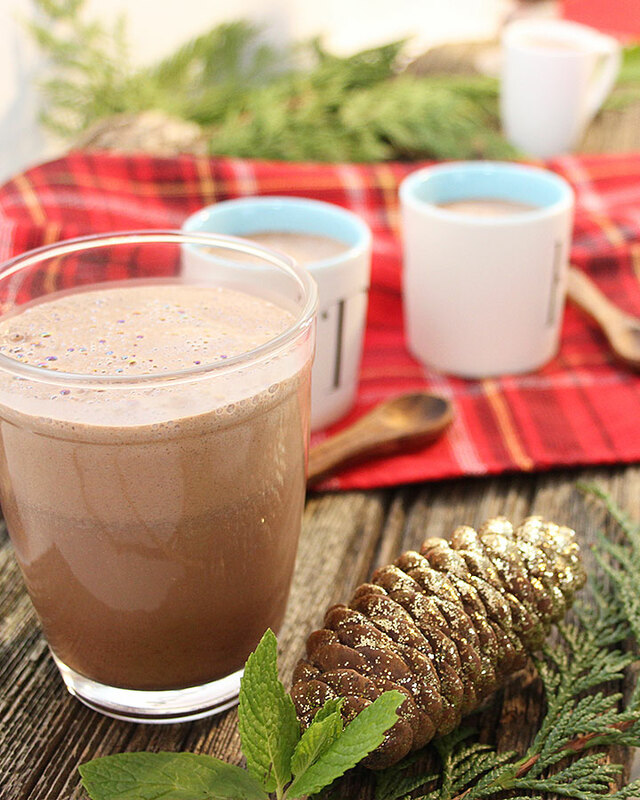 This healthy Mint Hot Cacao will surely impress you. The ingredients are clean, the drink is not too sweet, and it’s great for the whole family. You must try this simple, creamy and soul-warming hot chocolate recipe! The subtle hint of mint transforms this hot cup into something unique for adults. Especially the ones that can use a little help relaxing. For kids, the addition of natural sweetness like honey or maple syrup helps make their cup special. If you’ve never added cayenne pepper or even a little salt to your hot chocolate, give it a try! The pinch of cayenne and salt help elevate the flavour of each spice. The drink will still be delicious without it but just using a little (a tiny pinch) will surprise your palate. I prepared this drink as a thank you to my growing list of followers and supporters. This past year has been crazy. With many ups, and lots of downs. I’ve pushed through because of you! I want to keep encouraging you to eat more plant-based recipes and experience the benefits for yourself! For you, this could mean reducing the packaged goods you purchase. Or, cutting down on the processed and fast food you consume. Perhaps for your family, it’s about making better choices when buying meat. If you eat animal products, learn where it comes from, get to know your local farmers. No matter where you are in life, young or old, healthy or fighting a bug—food matters! Eating for your health is important! If you eat crap, you will eventually have to fight a health condition. It’s a known fact! If you make wiser choices and include a variety of wholesome nutrient-dense foods, your body should respond in positive ways. The crazy part is that it seems that many of us wait too long to adopt this way of eating. Can we not be proactive and consume foods that fuel our systems instead of feeding disease? The world is in a terrible health crisis, and sadly it affects all of us. My tip for all of you is to take the time to try new recipes. Heck, if you don’t cook, start by learning how to make one dish. You would be surprised at how engaged kids (and even your spouse) can be when you prepare something new. Initially, the recipe might need some tweaking but with time—and, your family’s input—it could become a weekly favourite. 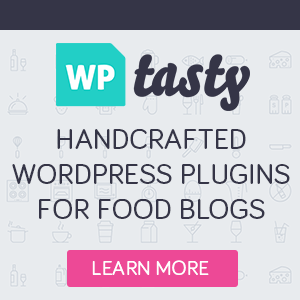 Are you looking for more simple healthy recipes? You could give my Vegetable Leek Soup a try. It’s pretty simple to make, and it’s packed with vegetables for those days when you know you need to increase your intake. For something a little sweeter, my Coconut Chia Apple Sauce Parfait is still one of my favourites. The combination of each layer transforms this healthy dessert into a crowd-pleasing treat! Each layer is terrific on its own but served together creates a mouth full of joy! Follow Fresh is Real on Instagram, Facebook, YouTube or Pinterest. If you’ve tried this Mint Hot Cacao recipe let me know what you think in the comments below! 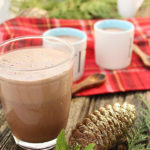 Prepare this soul-warming Mint Hot Cacao drink with the best organic ingredients you can find. By doing so, it will help you create the most dreamy, creamy, and comforting beverage for you and your family to enjoy! Add two cups of boiling water and one mint tea bag to a kettle, let steep for five minutes. In a high-speed blender***, add warm coconut milk, cacao, honey, spices and one cup of mint tea****. Turn bleeder on a low setting and slowly increase speed to mix all ingredients until frothy. Serve in your favourite mugs, enjoy right away! **Use 1/4 teaspoon pure vanilla extract as a substitute for vanilla bean powder. Or just leave it out. *** Make sure your blender can handle hot liquids. **** Keep the rest of the tea to warm up your drink as needed or to dilute it if you find it too thick.